With the riding trend of digital signage, people are constantly bombarded with ads that struggle to be eye-catching and dynamic. With such a rich assortment of ads constantly surrounding viewers, making your own ad stand out above the visual noise is more important than ever. The trick to success may be as simple as the colors you choose in designing your digital signage. Before designing your digital signage, here are some important things to consider regarding color use in your marketing scheme. Consumers will judge the ad based upon the appropriateness of the color for the product being sold (http://onlinelibrary.wiley.com/doi/10.1111/j.1745-459X.2011.00360.x/abstract). For instance, if you are selling a baby carrier, you will likely not go with a color scheme of blood red and black. Colors trigger emotions in people above and beyond their appropriateness. Great advertisers have used this to their advantage for decades (http://www.visix.com/using-color-psychology-design-digital-signage-messages.html). 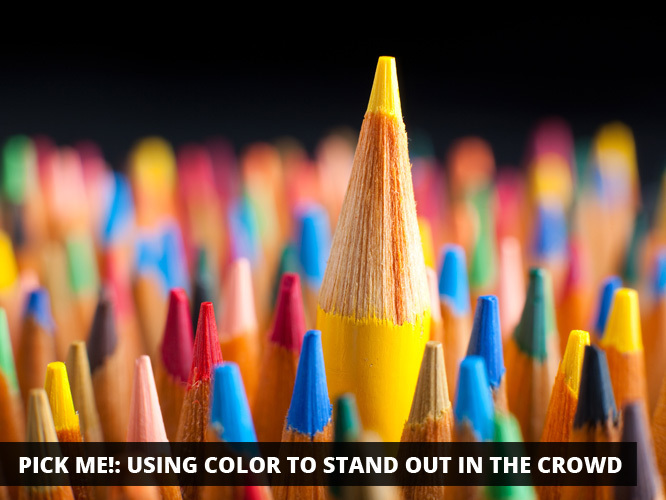 New brands will want to choose a color that makes them stand out from their well-established competitors. This is one of the brilliant things that Pepsi and Coke ever did: they created a red versus blue dichotomy between the two of them. Once you’ve chosen a color that is both appropriate to your product and stands out from your competitors, let’s move on to applying color appropriately to digital signage. Once you have chosen your brand-appropriate color scheme, make sure that the palate is both simplified and includes elements of contrast. Too many different colors can make your signage look cluttered and discourage your potential viewers from trying to sort through the mess. Choose a palette that works with your brand narrative and product, and stick with it. While you will want your digital signage to not be too cluttered with colors, you also want to include some color contrast to draw the eye. Choose one color to pop out of your scheme to attract attention. The trick is to strike the perfect balance between a simplified color scheme and one that draws the eye by use of contrast. You want to make the viewers’ job simple: draw the eye with a pop, but do not overdo it by confusing the eye with too many places to look all at once. Something else to consider when designing your digital signage is what is already out there in terms of color and design. One way to ensure that your digital signage catches the attention of viewers is that it stands out from other signs in terms of color scheme. For example, in an attempt to draw attention, many advertisements began using red because it is a bold eye-catching color. The way to stand out among a sea of red signage is to design a green sign to contrast your competitors. Similarly, you should keep in mind the size of the signage you are developing. One of the major concerns in publishing, for example, has become ensuring that book covers look good both on the shelf in the real world, and the tiny image that appears on Amazon and for ebooks. What looked great on the shelf can easily be unreadable online, a lesson that you should carry over to your advertising. With this toolkit of color tips in hand, you’re ready to get out there and design an eye-catching sign for your company!